[Jesus said, "The world] will do all this to you because of me, for they have rejected the one who sent me. They would not be guilty if I had not come and spoken to them. But now they have no excuse for their sin. 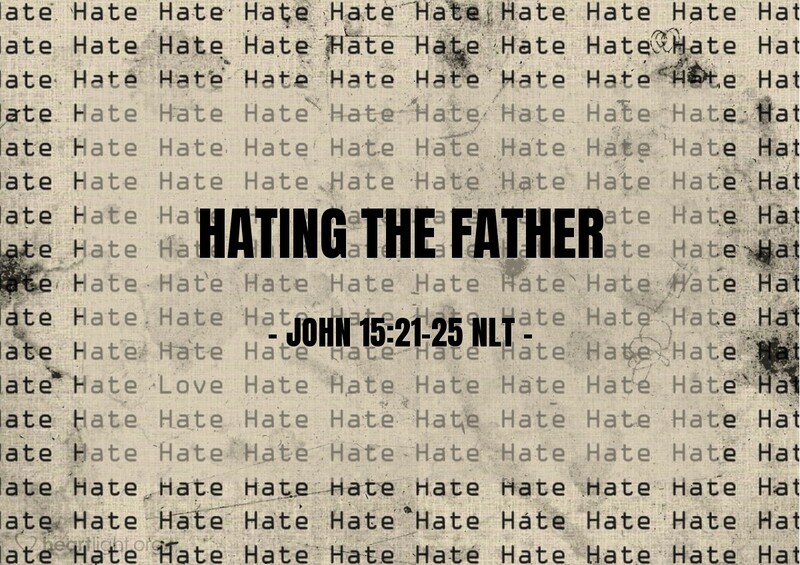 Anyone who hates me also hates my Father. If I hadn't done such miraculous signs among them that no one else could do, they would not be guilty. But as it is, they have seen everything I did, yet they still hate me and my Father. This fulfills what is written in their Scriptures: 'They hated me without cause.'" When Jesus' disciples today face rejection, persecution, hardship, and hatred because of their faith, they need to know that they are not alone. Jesus also faced these things. Other Christians before them have faced these things. That rejection, whether today or in years past, is not the rejection of the disciple, but the rejection of God. Jesus' disciples never go to face hardship alone. They are surrounded by a great cloud of witnesses testifying that it is worth every effort and hardship to endure to the end. They are accompanied by a God who lives inside them by his Spirit and promises never to leave them or forsake them. Jesus' disciples must not take their persecution and mistreatment personally; they're not being rejected, but God and his will and his grace are being rejected. As Jesus' disciples, we need to be faithful, and we will find the victory crown of life that awaits us! Give me courage, dear Father, so that I will always live passionately and faithfully for you and your Kingdom. Give me the strength to never compromise my faith, my integrity, or my morals when facing hardship, scrutiny, or mistreatment. In Jesus' name, I pray. Amen.